With very little sleep (having finished night shifts) I made my way to Luton for my late afternoon flight to Budapest. There was never going to be time to do much with the day but I could at least get a ride into the city from Feirhegy (Airport station). Or so I thought at least. I missed a bus in the scramble to get a ticket at the airport but didn't have to wait too much longer for the local bus to from the airport to the station. The machine wouldn't take my Forints (left from a previous trip) so it ended up being a card transaction. The timetable at Feirhegy revealed that I should have just missed a train and unfortunately it looked like it would be a 25 min wait for something hauled into the city. Long before the 25 minutes was up it became apparent that all was not well. It turns out the announcement in Hungarian was a message of doom and another passenger finally tipped me off that there was a problem with the trains and 'maybe' there would be none until 21:00, I waited a little longer just to see, but with no sign of a train eventually gave up and headed back to the bus. Here I encountered my next issue, buying on board as I now had no ticket I handed over my money to be told 'Old Forint!' by the driver. I tried another note... 'Old Forint'. This wasn't going well! Totally perplexed I gestured I had no other money and after a shrug from the driver took a seat. Some passengers explained to me that the money had recently changed and clearly since my last trip the paper Forints were no longer legal tender. I could exchange them in a bank but that wouldn't help me get to the city. At Kobanya-Kispest I could at least use a card machine and get a ticket from there. No need- some great Hungarian hospitality persisted and a gentleman from the bus insisted on giving me a ticket for the metro. I checked into my hotel and went off in search of food. I found a lovely place that served some sort of pancake type thing- with Deer meat! It did the job and I was back at the hotel in reasonable time, by this point being quite tired and well ready to hit my bed! My one day in Budapest started with a trip to the bank to exchange my 'Old Forint's', which it had turned out had only expired around a month earlier. 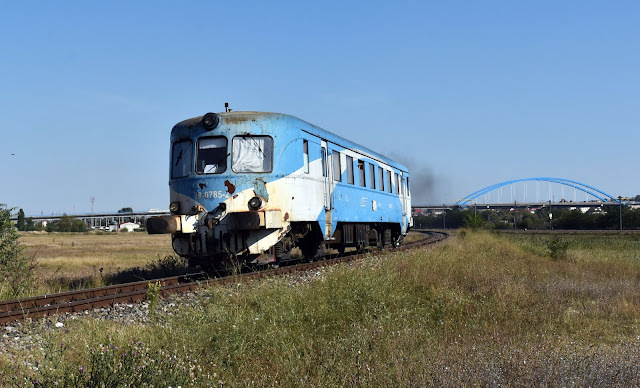 The railway target of the day was the Lajosmizse M41 turns from Budapest Nuygati which I had failed to cover on previous trips. These run hourly for most of the day with a couple of gaps which appear to be filled by Desiros. With a plan in hand I had time to explore the beautiful soviet architecture on Metro line 3 (plenty of material for a later post!). By the time the sun had come out there was a little time to spend with my camera at Kobanya-Kispest during which time I was rewarded with 3 freights, and a surprise, the Venice Simplon Orient Express (in totally the wrong place and direction for a photo). I also bumped into heritage M41 2143- noting it's diagram so that I could finally catch up with it later in the day. 418 149 was my first train down the branch towards Lajosmizse. It is great to see a line worked almost entirely by reasonable diesel locos with opening windows and not even a push-pull trailer in sight. On a negative note however the line speed is very slow meaning the journey is somewhat of a stagger. Several more moves ensued before heading up into Nyugati having failed to make it the previous night. I found myself a nice V31 to take me on to Kobanya-Kispest however all was once again not well. Departure time came and went and our train did not move. Shortly before I gave up together and got on the M41 behind (which I would drop back onto) we got on the move and crawled out of Nyugati. If I wanted a spirited run this was clearly not going to be it. 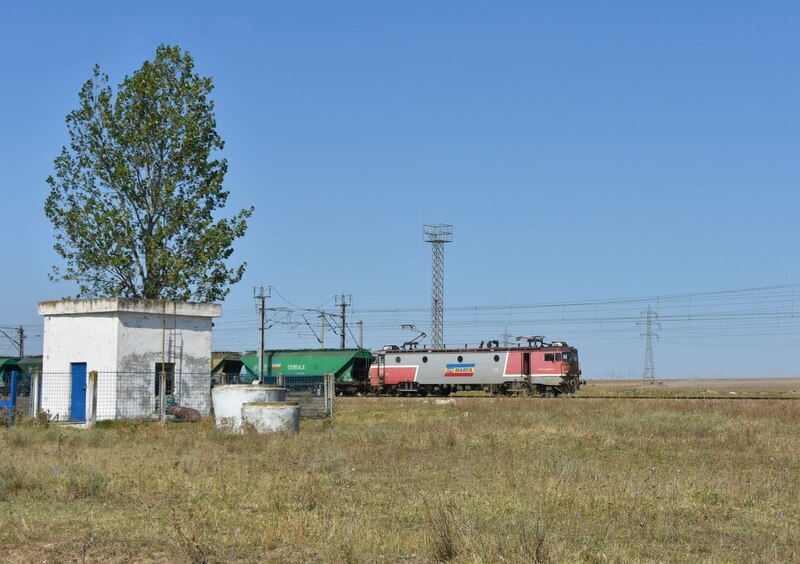 We soon came to a halt at a signal displaying no aspect and I noticed the M41 following very closely behind our train, and then noticed the rear of the previous train a short distance down the track in front of us. Clearly there had been some sort of major signalling failure which was throwing the service into tatters. The journey to Kobanya - Kispest was delayed around 50 minutes with the train crawling between stops at little more than walking pace. I'm pretty sure the method of working that had been adopted was 'line of sight' in places and I also came across at least one ground signaller. The good news was that I knew my M41 would still be behind me, the bad was that the schedule had been thrown out of the window. 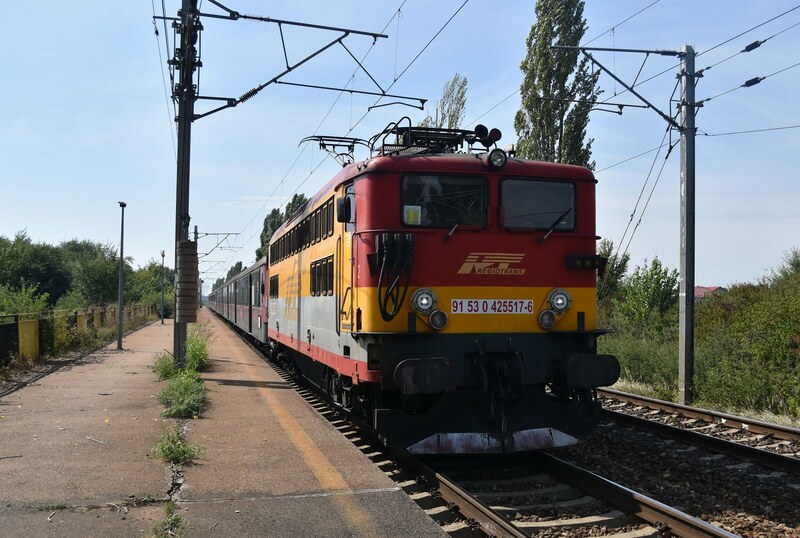 I stuck with my plan and positioned myself for a photo of M41 2143 working the 15:18 Budapest - Lajosmize. Almost an hour after the train should have turned up I finally resorted to loading the MAV Mapper up on my phone. No sign of the train I wanted, but I could at least see that the following one was sitting waiting to leave Kobanya Kispest. The sun had gone round a little more than I would have liked but it was at least a shot. A final look at the Mapper before I left revealed that M41 2143 was finally on the move and this turned up about 5 minutes later. Knowing there were single lines ahead I ran on to Kispest station to see if I could catch the train again. I could, as it turns out that M41 2143 was being terminated and passengers transferred to the train which had run in front of it (the one booked an hour behind it). All in all a total farce but I got some good photos! 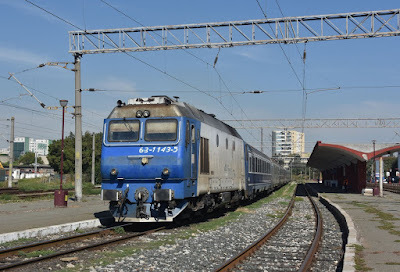 M41 2143 at Kispest after terminating due to signalling problems. I was grateful there was a nearby tram line as a back up to get back into Budapest but finally M41 418 149 turned up for the run back into Budapest- clearly trains were still leaving from Lajosmize on time. On arrival at Kobanya Kispest the conductor came round the train and turfed everyone off- the reason was soon apparent, we had gone into one of the terminal platforms. For the second time in two days I would not be going in to Budapest Nyugati! With the train service comprehensively broken again it was left to Metro line 3 to take me into the city centre for a relaxing visit to the Rudas Baths and a very pleasant dinner. After picking up my bag it was time to head over to Budapest Keleti for the 22:50 to Bucharest. The refurbishment of the station is now mostly complete and it is certainly a fitting gateway to an international journey. 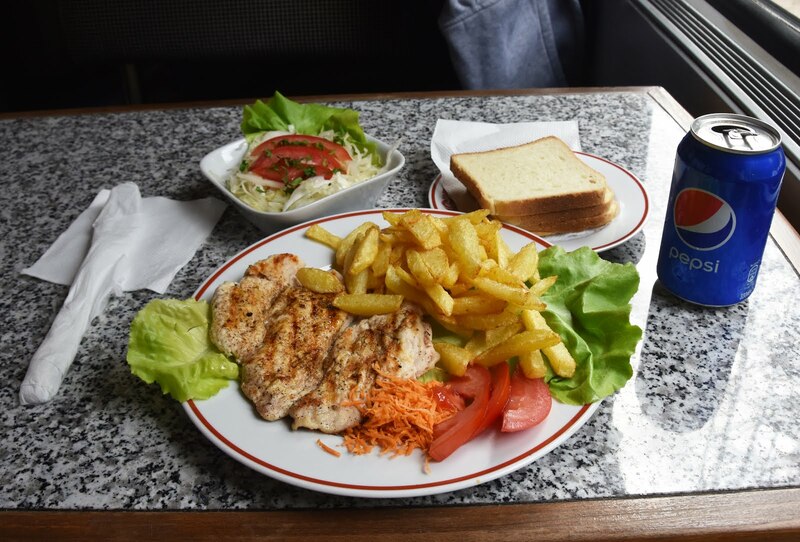 On less of a positive I had no idea whether my train had a restaurant car and had missed the SPAR over the road to spend my last few 'New Forints' on emergency supplies. Fortunately the 24 hour alcohol shop came to the rescue as it did also sell water. 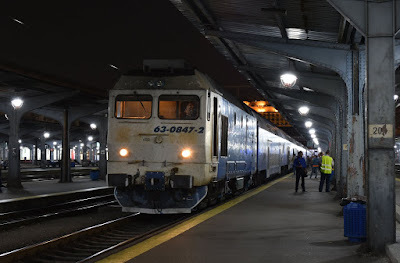 After watching the Belgrade sleeper depart, the Bucharest train arrived from Vienna with 470 003, after a quick check of our forwarding loco, Romainian 47 7689 it was time to take my position in my 4 bed compartment for the night. Unfortunately this was already occupied with 3 passengers and was a top bunk. After enjoying the fresh area at a corridor window until the outskirts of Budapest it was time to sleep and it didn't take long after a busy day. 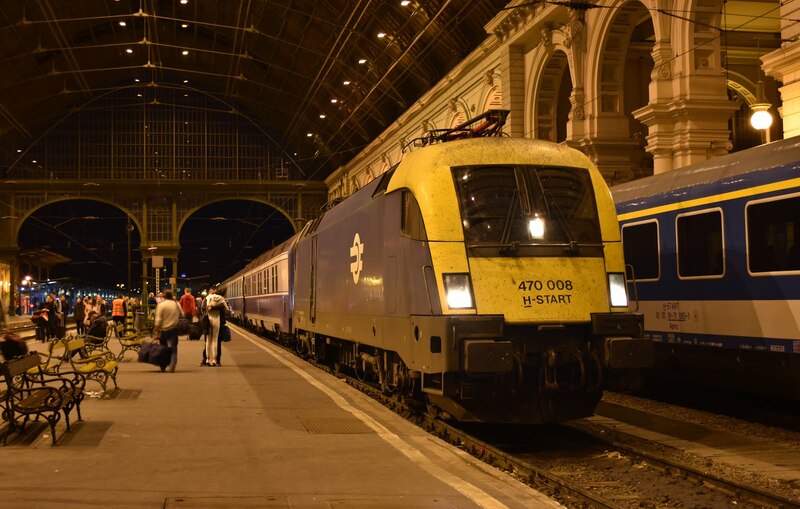 MAV 470 008 arrives into Budapest Keliti with the Vienna - Bucharest sleeper. All credit to SNCF ear plugs- I'm a light sleeper at the best of times and it was a new experience having to be woken up by security staff at the border. Passport formalities were not big issue either on the Hungarian or Romainian side. For a moment I did think I might get a stamp as the Dutch guy in the other top bunk did- maybe if I had asked...? Before turning back to bed I quickly fired up my phone to check our location and the time. It was around 02:00 and we were not far from the wonderfully named Locoshaza on the border. By my reckoning we had travelled about 1/3 of the distance to Bucharest in not much more than 3 hours. Our arrival time was after 14:00... clearly Romainia was going to be a stagger! from Budapest in the restaurant car. I woke at around 08:00 and there was no rush to get out of bed. The weather seemed fairly dull and I couldn't really see much out of the window anyway from my top bunk. The Dutch guy had left already and the two older Romainian ladies were still inhabiting the lower bunks occasionally scowling. When I did eventually rise from the compartment and made my way to a window I was rather surprised to discover we had a diesel at the helm of our train (clearly I had done a lot of desk research back home!) and were on what looked very much like a non-electrified secondary line. 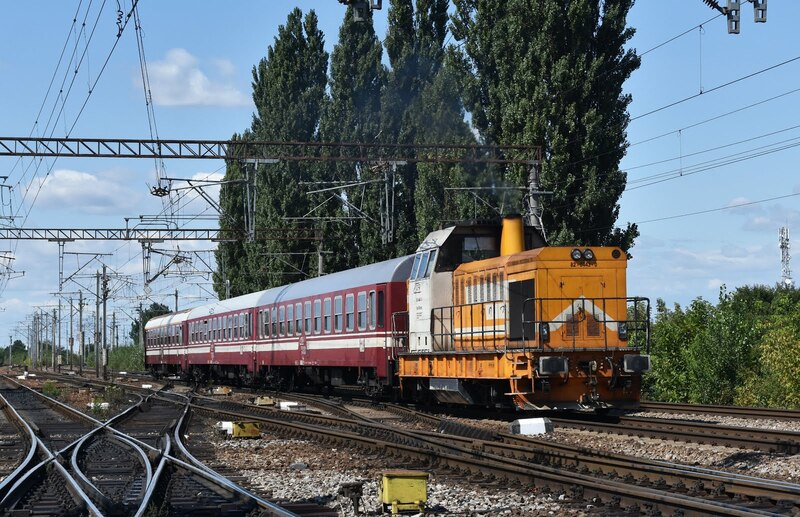 Having started with a Romainian electric in Hungary I had incorrectly assumed that the loco would take us right through to Bucharest. 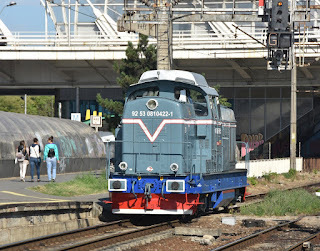 Upon arrival at Sibiu I was able to confirm the identity of our loco as 64 0976. There was time for some photos while an engine swap took place, 64 1179 now taking charge forward to Brasov. The line forward form Sibiu is scenic and very very very slow! Vast amounts of lineside vegetation cover pretty much everything including much of the running line. At times it would have been little slower to walk, the GM provided entertainment though and I found myself an empty compartment further up the train (the two Romainian ladies in mine had between them managed to occupy the entirety of the lower bunks in seated formation with themselves, their bags and associated paraphernalia). I had no real desire to help them cover the floor with monkey nut shells and the seats in the day coaches were more comfortable anyway. 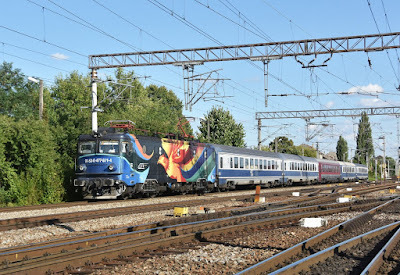 A RegioTrans ex-SNCF Carvelle 67-0669 waits between duties at Brasov. 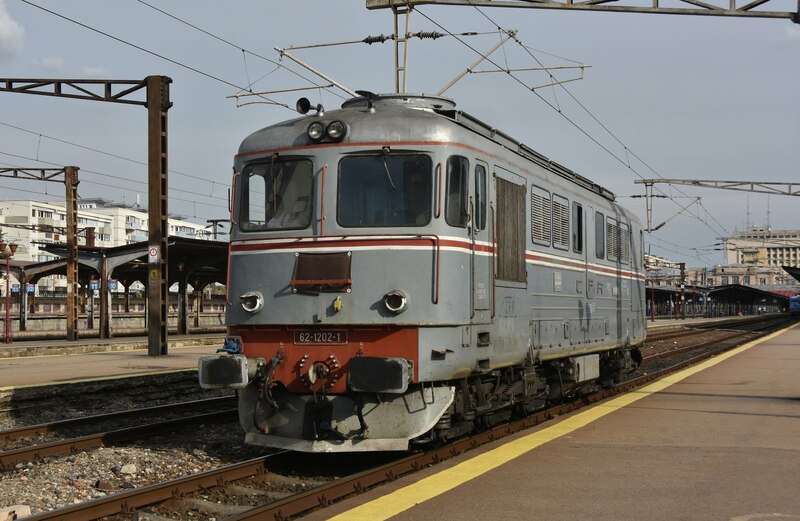 At Brasov I got my first glimpse of ex-French stock with BB25517 on a Regiotrans service to Bucharest as well as a 'Carvelle' in the yard. It was now well overdue time for lunch and although I did have my emergency supplies as it turned out we did have a restaurant car on the train and it would have been rude not to try it. A fellow passenger had warned me that the offering was 'abysmal' and that they 'didn't even have any sandwhiches'- clearly he hadn't asked for proper food. I did and the offering appeared to be 'grilled chicken' which I ordered and must say was pretty good. I understand the restaurant car on this train may be withdrawn from the December timetable, maybe not a surprise considering it's minimal usage. The landscape had flattened by the time the train reached Budapest where we crawled into Gara de Nord 1 minute late (not at all bad considering the distance). I checked into the Ibis, resolved a little issue that my companion for the trip James Hawkes and I had been booked a double rather than twin room, and then headed back to the station to meet James who had flown in from London before we went off in search of our first Sulzer on the 16:40 to Slobozia Veche. Bucharesti Gara de Nord is a fairly pleasant station, more so than I was expecting and we received no hassle while spending a few hours watching and photographing the trains. 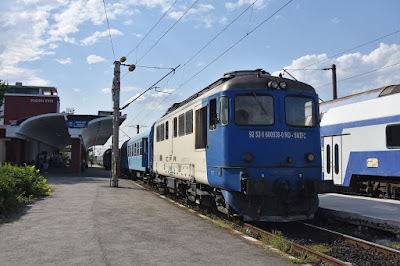 We had made notes of the RegioTrans arrival times with more ex-SNCF BB25500's (4 diagrams a day are booked between Brasov and Bucharest) and also enjoyed a few diesels before calling it a day. It had clouded over and with an excellent forecast for the week ahead it seemed a good opportunity to have a look around the city before it got dark -seeing the city before dark- most unusual for these trips! 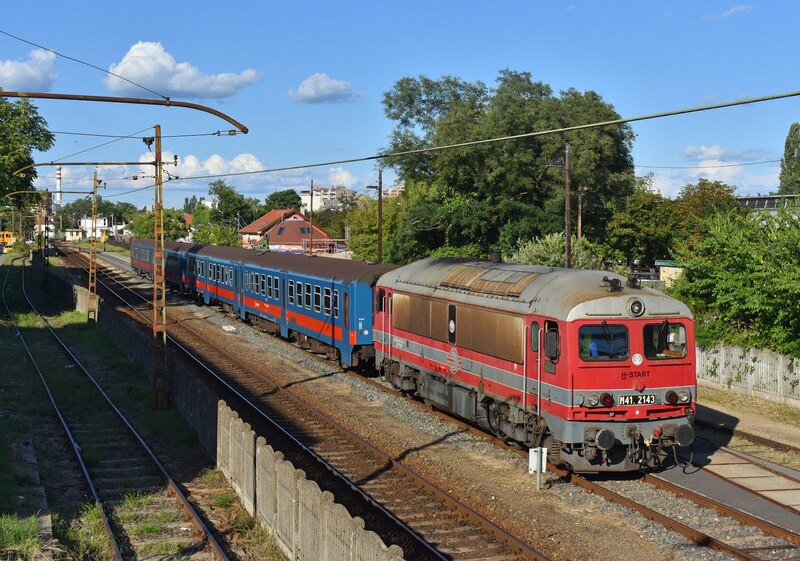 RegioTrans BB25576 arrives into Bucharest with the 07:00 from Brasov. The morning was spent picking up where we had finished the night before, watching the morning rush at Gara de Nord. Light is good for the RegioTrans arrivals and there were a couple of Sulzers to watch out for with 60 0748 arriving into the annex station from Slobzoia Veche at 09:38. 40 2302 the last example of its subclass at Bucharest Gara de Nord. The rush over with we headed on to Chitila in the suburbs of Bucharest in search of some freight. On arrival we were greeted by one of our big targets for this country- a pair of ex-SNCF Fret BB25200's! Unfortunately they were on a train positioned in the worst possible location for the sun- but good to see. To make things even better there were another pair in the yard along with a Romainian class 60 Sulzer. A pleasant morning was spent here watching the proceedings and searching for the optimum location for our photos. As usually happens after a few hours I began to get the itch to move and leaving James behind made my plan to head back into Bucharest and get a few moves in- this plan soon changed when 62 1196 pulled into Chitila while I was waiting on the platform with the 15:03 Bucharest - Targoviste. 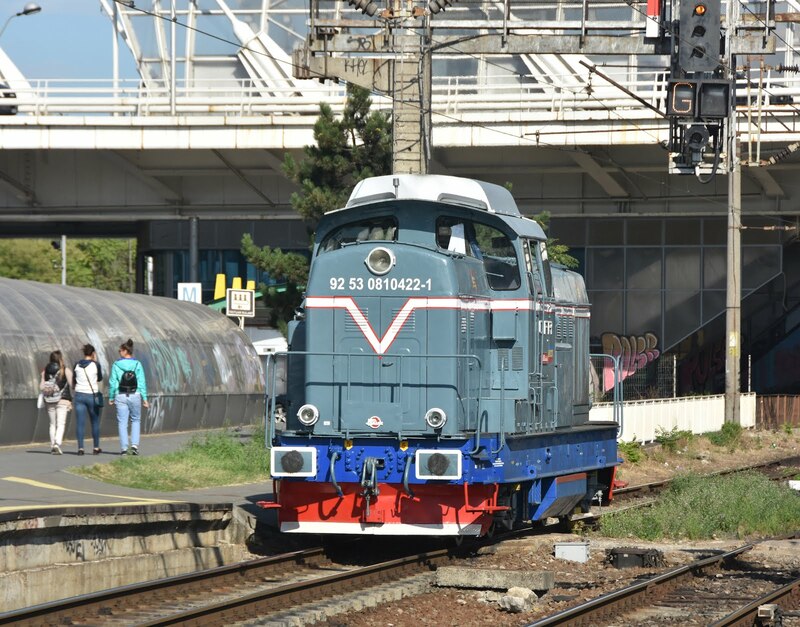 A very fresh looking 81 0422 shuts at Bucharest. I took this up to Bildana for a GM back as far as the shack at Carparti H in the city. I had a bit of a run in with the guard on this one who really really did not like my FIP coupons. He was actually quite aggressive and kept pointing to things and shouting- The covering letter explaining the 2nd day validity did nothing to appease him and eventually he disappeared muttering something about going to the info booth at Bucharesti Nord. Carparti H turned out not to be just a rateable shack but also an excellent photo spot. 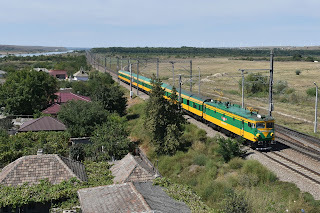 It wasn't long to wait until 62 1051 appeared with my next move back to Chitila on the 16:40 to Slobozia Veche. 62 1196 pauses at Bildana with R9013 the 15:03 Bucharest - Tirgoviste. The thrash wasn't amazing given the terribly low line speed, however the loco did put a bit of welly in once I had got off! Reunited with James we headed back to Carparti H for the evening RegioTrans departure and to take in the last of the days light. Our passage back to Gara de Nord was by tram after the train we were waiting for never materialised. We couldn't work out how or where to buy a ticket for the tram but the driver didn't seem too concerned- having been fined in Sofia I am always very nervous about tram tickets these days! 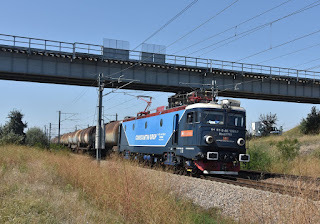 Constantin Grup 40 1083 heads east at Medgidia. Today's target was the line towards Constanta which we hoped would be busy. The day got off to a poor start when we arrived at Bucharest Gara de Nord to find the arrivals and departures screen riddled with delays- most of them reaching into three figures. We had obtained a reservation for our train to Medgidia the night before from the surprisingly helpful and efficient reservation hatch (rather than the main ticket office) at Bucharest. Our train was only showing around 45 minutes late, but having worked out that the inbound stock was closer to 140 late we weren't holding our breath. I would love to know what had caused the issues which seemed to be affecting pretty much every train into Bucharest- I even resorted to trying to translate the CFR website to find out what the problem was but to no avail. 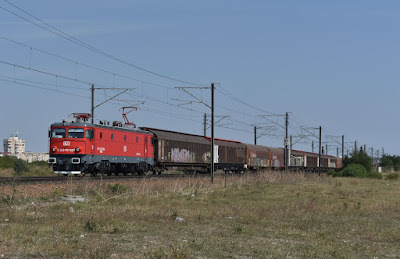 CFR 47 4011 heads east from Medgidia with a cereal train. After a little while a delayed train to Constanta appeared and while it wasn't the train we had reserved we figured it was fair game to get on given that we were already over an hour behind our planned departure time. 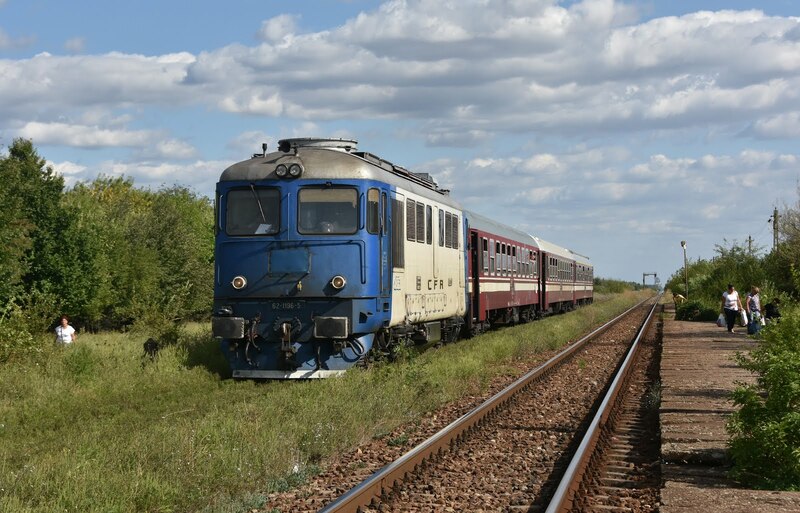 We didn't have any issue with our reservations and were surpised to find that the Bucharest - Constanta line actually has a very reasonable linespeed! Upon arrival at Medgidia we quickly discovered that the photospot we were looking for really wasn't anywhere near the station. We did find it however, being passed by quite a number of interesting trains on the 40 minute walk. 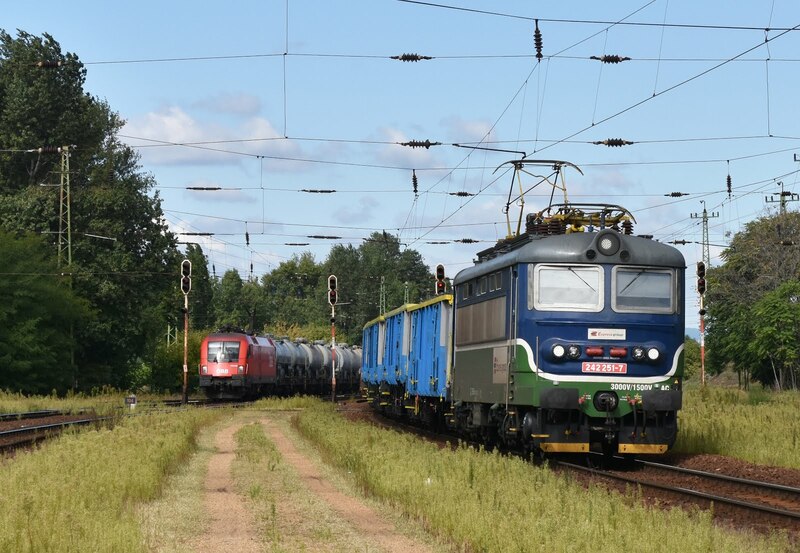 DB's 47 0783 heads towards Constanta with a class 651 'Ludmilla' at the rear. 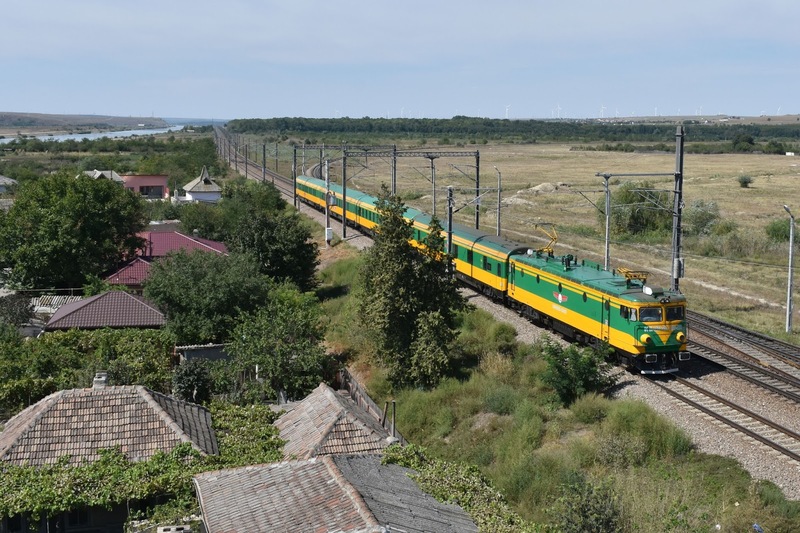 At this point the railway follows the Danube - Black Sea canal. Of course once in position the freight seemed to dry up- it was short lived however and before long our reward arrived in the form of a very nicely lit train of boxwagons behind GFR's ex-SNCF BB25109. 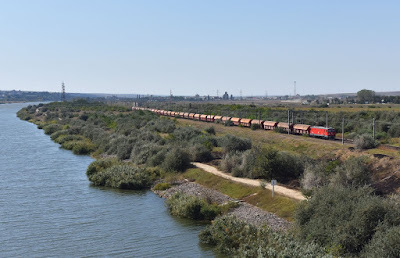 Across the river from the main Bucharest - Constanta line is a large cement works which sees several diesel hauled trains which come across a bridge perpendicular to the main line before then taking chords back to either Medgidia or towards Constanta. The afternoon proved to be busy and plenty of rewarding shots were achieved. Later in the afternoon it became time to move on after a lineside fire started to smoke out our location- back home I'm sure all trains would have been brought to a stand, but fortunately not over here. We had noticed a few trains stopping at a station a little further down towards Medgidia which turned out to be Castello- plenty of opportunity for photos here but our time was cut short by needing to get back to Bucharest- if we missed the local trian it would be a very long walk- fortunately it turned up on time! Danube - Black Sea canal. We changed at Medgidia and due to our connection being later did have time to purchase a reservation. What a faff that turned out to be! I'll conceed that the booking lady was trying to be helpful when presented with two foreigners who had odd tickets she had never seen before and who didn't have a word of common language. It took some while to persuade the lady that we wanted to travel on a train that should have already left (it appears she did not realise it was delayed? )- once we eventually got our Res we were ushered quickly out of the booking hall in the direction of the platform and told to hurry. There was still time to buy an ice cream from the stall on the platform and photograph the class 60 that had turned up before our train rolled in. The train was busy but we found seats in a compartment and James disappeared to the restaurant car to return with a well needed beer. 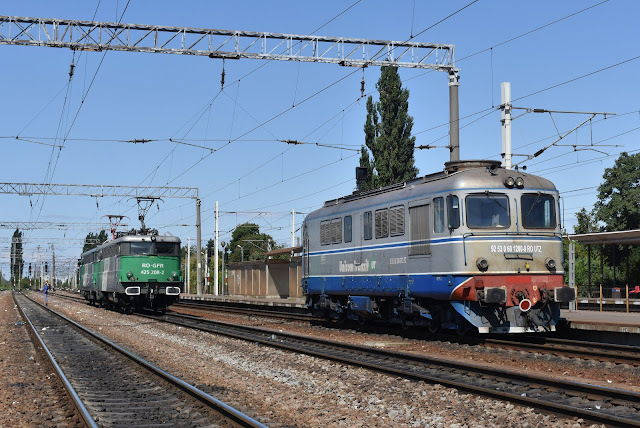 63 1143 waits to depart Constanta with a through train to Mangalia. Having had such a good session on the Constanta line the previous day we choose to do the obvious thing and head back again! 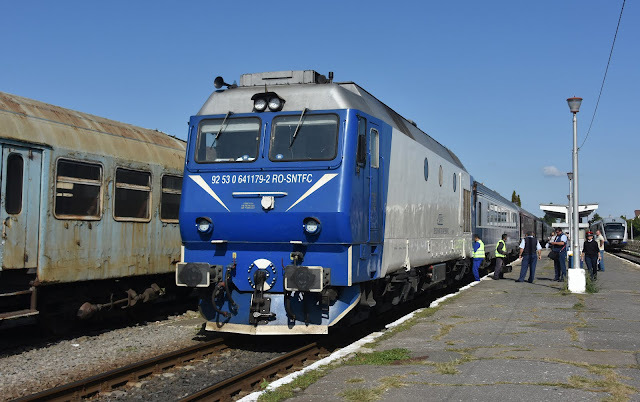 This time we took the train through to Constanta as there are several diesel workings which can produce both class 60's and the small (and ancient) 'Malaxa' DMU's. If we were going for these we were wasting our time (as we realised on the way down) as during the summer a number of the GM diesels migrate to Constanta in order to provide through trains to Mangalia. 47 0451 approaches the station at Medgidia. 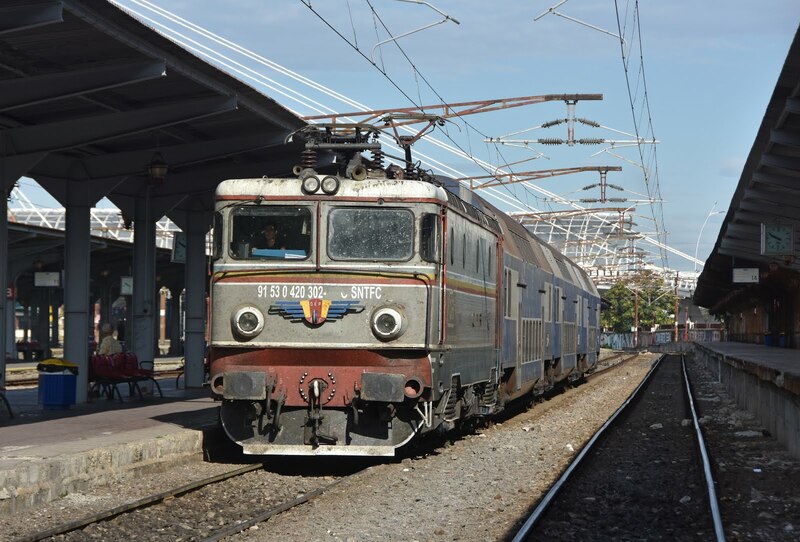 Slightly annoyingly we sighted our only non-Fret liveried BB25200 on the way through Medgidia non-stop, one of the remaining 'Concrete' examples- of course by the time we were back it had gone! Our train indeed received 65 1143 to run through leaving a 60 dormant in the station and no sign of any Malaxa's. Constanta proved to be rather less busy that we were hoping so we soon made our way back to Medgidia on the first available train. I tried to check with the train guard that it was the train we wanted but he unhelpfully refused to tell me until I showed him a ticket, a little faff later and it was confirmed that it was. 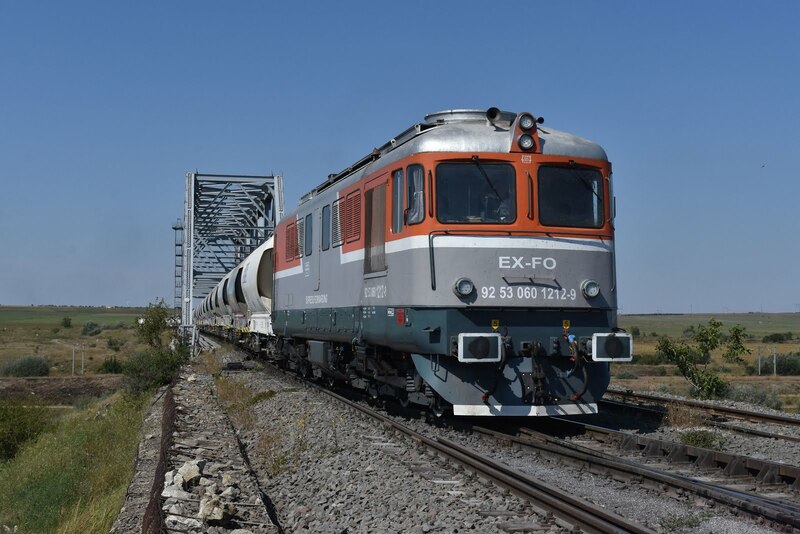 I visited a couple of other locations to the west of the station today, this also gave us the opportunity to view the afternoon Malaxa turn to Tulcea Oras which produced one of the larger bogie Malaxa 1000 railcars. Once the afternoon local trains started running I explored a few more shacks on the line near Medgidia before we once again took the same train as yesterday back to Bucharest. This time we didn't have a lot of time to get a reservation, and based on the previous day's experience we decided not to bother- this wasn't an issue and to be fair the train was wedged, we joined many passengers who were already standing for the 3+ hour run back to the capital. Not far from Medgidia our 'Concrete' SNCF friend was sighted again- it clearly hadn't got very far in the space of 8 hours or so. 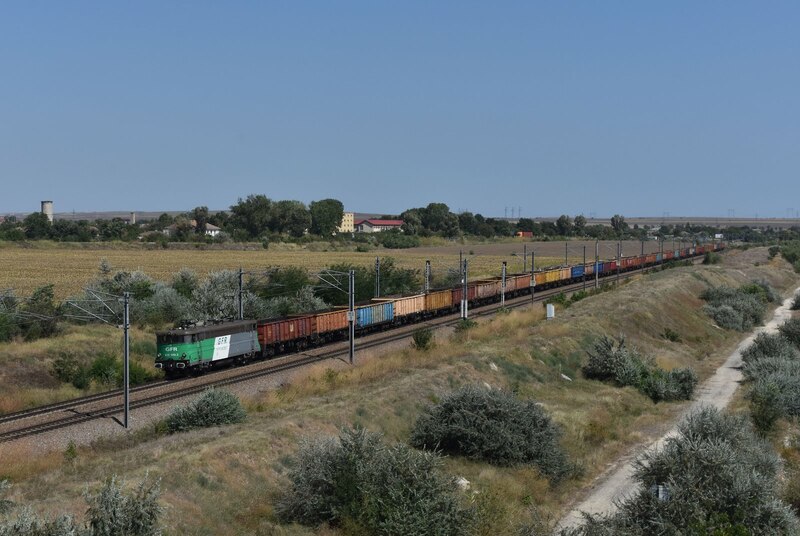 Freight trains, even where plentiful, seem to be particularly slow in Romainia being looped at almost every opportunity- usually not for any apparent reason. 63 0847 waiting for departure - possibly the 23:15 Bucharest - Piatra service. Unfortunately the restaurant car of our train had no beer today and we were certainly grateful for refreshment when we arrived back in Bucharest. After dinner at our hotel (it was late) where we accidentally bumped into a couple of British rail enthusiasts (lovely to meet you Chris and Mike) I headed back to the station for some night photography- I figured I might as well get some use out of my tripod having brought it all this way! 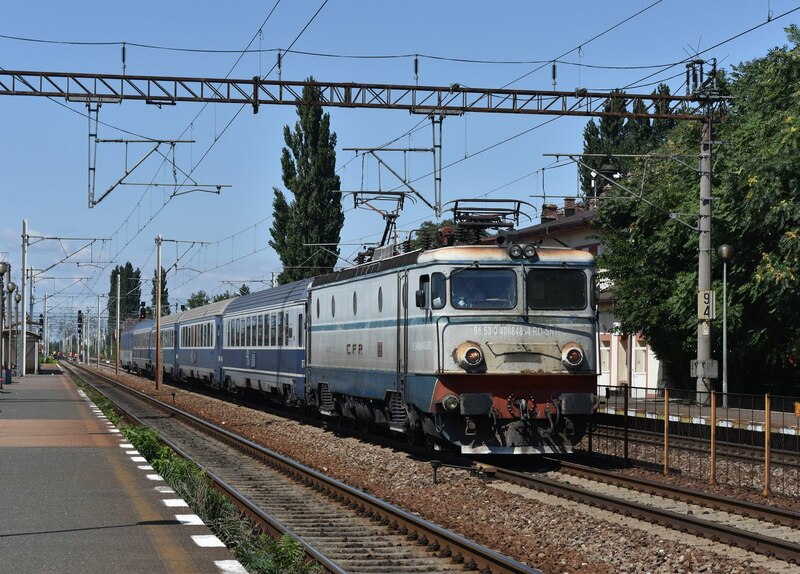 BB25517 works the 11:40 Bucharest - Brasov for RegioTrans. This was always set to be our 'mop up' day. 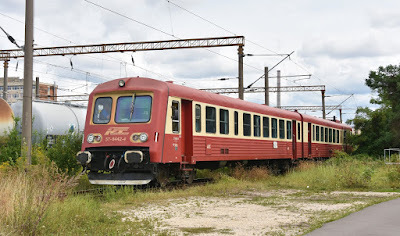 There were still a few things we wanted to achieve, I wanted to cover a few more runs with the Sulzers as well as a BB25500 and we also both wanted to see the smaller Malaxa railcars in action. 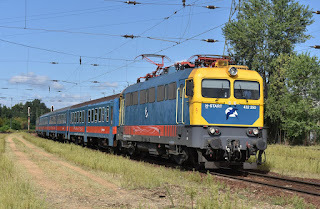 A plan was made to cover some of the early diesel turns starting with the 07:37 to Urziceni before heading up to Rosario on the Craovia line in the afternoon. There are a few more Sulzer turns here and also a few Malaxa's, although significantly less than on a weekday. The run out of Bucharest behind 60 1038 was good fun and we took this to Cacaulati where we bailed onto 62 1051 heading back into Bucharest on the 06:05 from Slobozia Veche, this providing a nice out and back Sulzer run of about an hour in each direction. 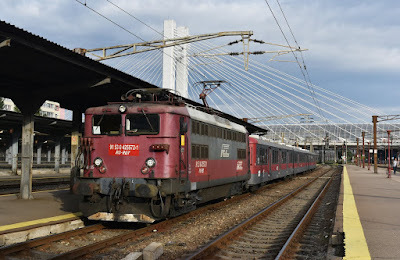 45 0364 stands at Rosiario Nord having worked the 13:50 from Bucharest. Back in Bucharest there was a little time to kill before the 11:40 Regiotrans to Brasov with ex-SNCF BB25517 so I took the metro into the city for a bit more sightseeing. Back at the station the 'Frenchie' was taken to PO Darza for a +5 back into Chitila and Bucharest. On the way I had passed 472 002 'Mricea Eliade' (former British 92001) which was stabled at Buftea, the first of these locos either of us had seen all week. The station turned out to be a complete shack and I will confess that I did get a bit worried when my train didn't turn up at the expected time. Turn up however it did, around 25 minutes late (I had started to worry a lot less when some locals turned up on the platform. I'm sure they wouldn't have been there for the following train some 4 hours later). 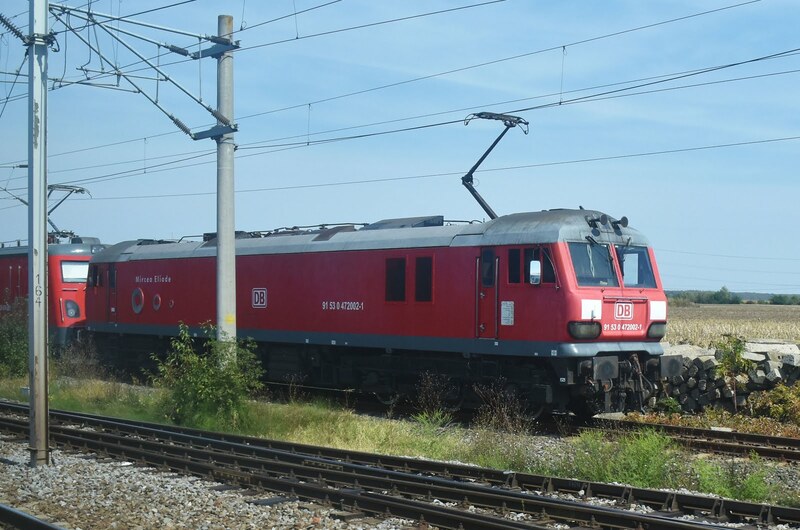 92001 which has been exported by DB Schenker to Romainia. There was a nice connection at Chitila picking up a GM into Bucharest. I didn't have time to get both a Res and lunch before my required train towards Craovia for Rosario Nord- you can guess which option won! 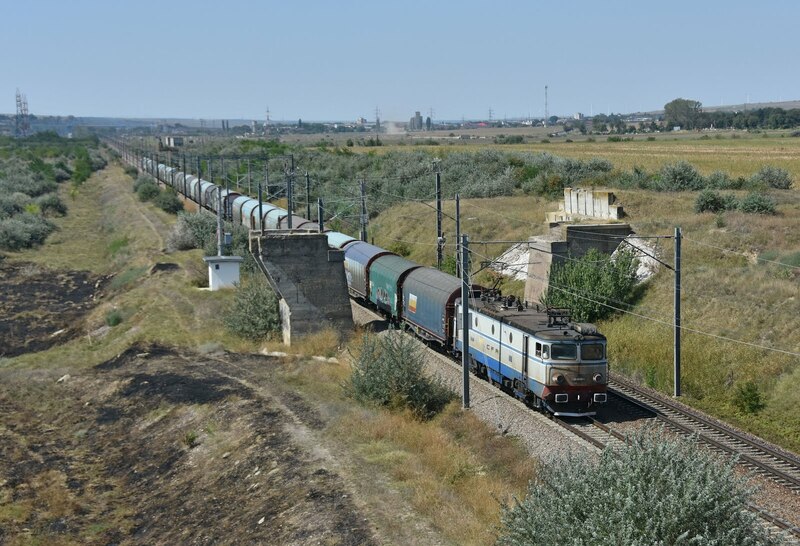 I have to say the journey was fairly uncomfortable on a load 2 train of some of the tattier stock running out in Romainia. The corridor was full so I stood by a window. This would have been fine had somebody else in the corridor not insisted that all the windows were closed! I cannot for the life of me work out why as it was sweltering! 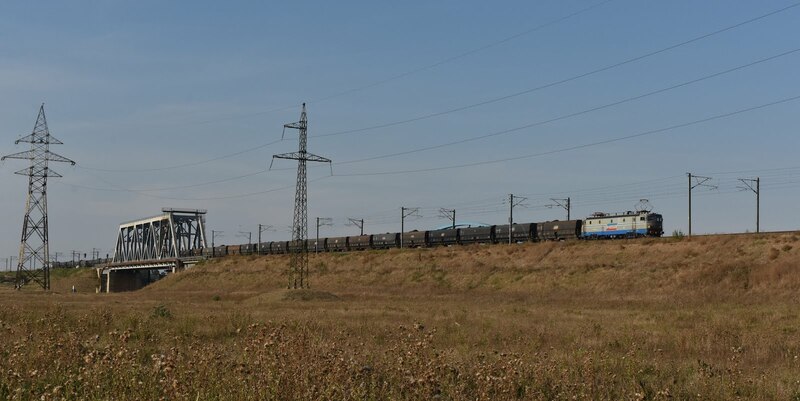 Another 92 was passed at a logistics park just beyond Chiajna at the tail end of an Intermodal train in a non-electrified siding. Clearly not going anywhere particularly soon. Finally reunited with James having left him on the Sulzer from Slobozia Veche some hours earlier we camped out waiting some Malaxa action. 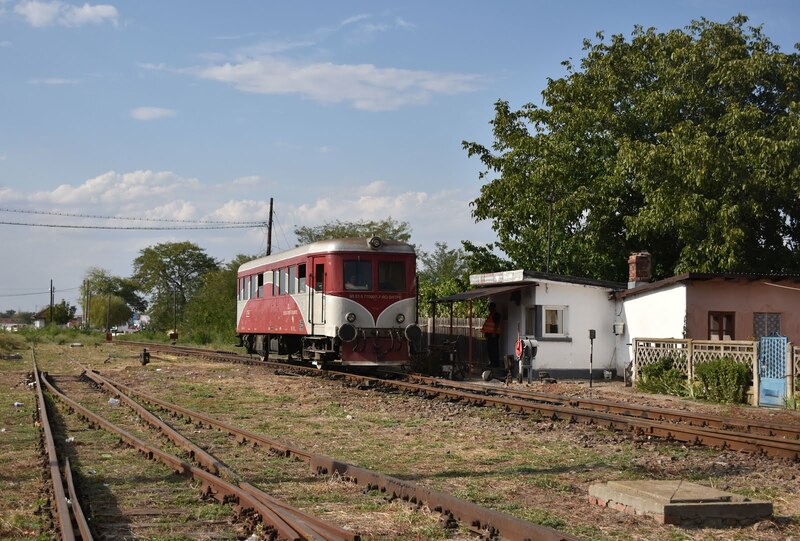 One appeared as booked for the 16:32 to Tumu Magureli- These DMU's are very ancient originally dating from 1935 and re-built in 1987- I had considered taking a ride but while the DMU's are photogenic on the outside the interior was certainly nothing special. Instead I spent the some time hanging around 60 0938 which was forming the 16:30 to Alexandria. Despite my best efforts I failed to get a cab ride from Rosario Nord to Rosario (I'm sure the secondman would have been fine with it but the driver was less keen!) so had to ride on the one coach instead. 60 0938 prepares to haul its single coach with the 16:30 to Alexandria. On arrival at Rosairo I had time to photograph the Malaxa which followed behind before walking back to Rosario Nord, a walk of about 20 minutes plus ice cream stop. 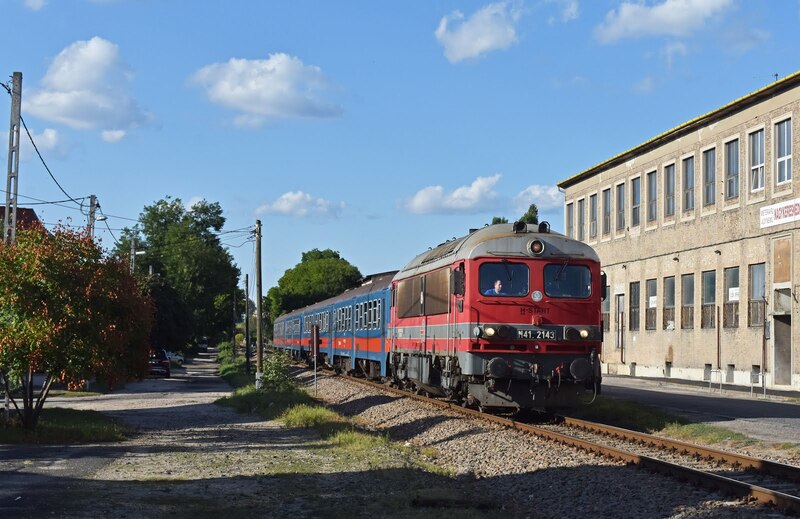 If I had more time there would have been a nice move to take the Sulzer through to Alexandria for another back, but instead we decided to head back to Bucharest at a sensible time- after all it was going to be our 'night out'. The last activity (and last train of Romainia as it turned out) before heading 'out' was a ride on the graffiti ridden Astra IVA train sets which now exclusively work Metro line 4 in the last days of their lives. This was the only time we had really had any hassle in this country taking photos- they definitely don't like it underground. 40 0848 passes Chitilla at speed with an express bound for Bucharest. 06/09/2017. 47 7871 with what must be one of the best liveries I have seen passes Chitilla. All in all an excellent trip with Romainia turning out to be a much more pleasant and busier country than I had expected. Budapest as ever was good fun- a lovely city and good trains to boot. Train services in Romiania away from the Constanta line tended to be a bit of a stagger and even I was impressed that between the two countries the train service had gone so badly wrong on 3 occasions (a transferable skill from my desk at work it would seem!). 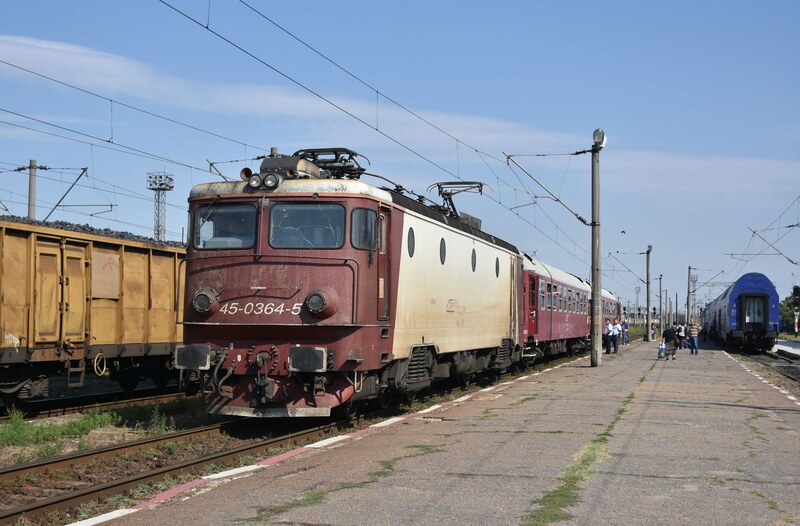 Trains in Romainia were generally to a good standard- I didn't encounter any trains which didn't have fully working toilets and many trains are comfortable with air conditioning. 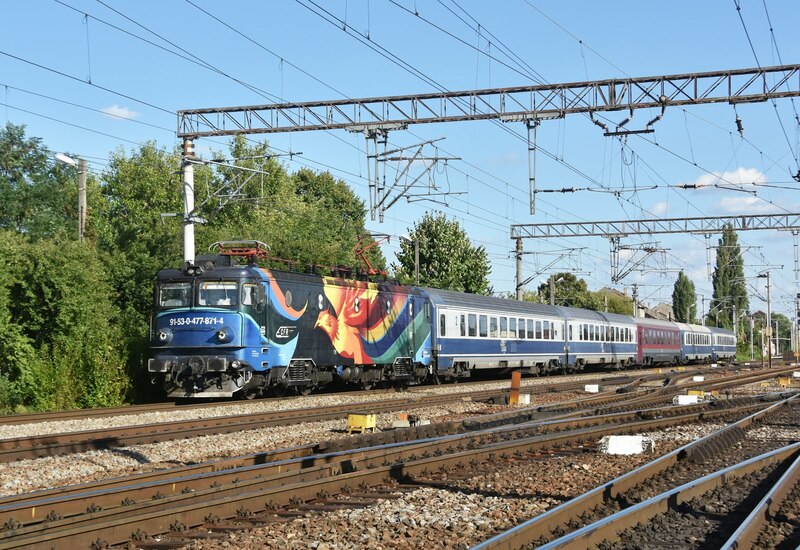 Some of the more premiere coaches are amusingly painted in a livery that looks very very much line an Austrian 'RailJet' - right down to the font used on the side. Ticketing was FIP coupons which thoroughly confused almost all of the grippers. I think I may have been lucky that only one gripper wasted a box by filling in the date having not understood the 48 hour validity (despite being shown the covering letter!). James got on a lot better with his Interrail, though we both found that if we had a reservation (and we didn't always) that the gripper lost all interest in the ticket itself. We encountered very few issues with photography, the only real issue being at Bucharest when to be fair we were probably somewhere where we shouldn't have been. We didn't attempt to visit any depots having been warned against it before leaving home! 470 738 is seen heading west from Medgidia. 08/09/2017. The SNCF locos were far easier to photograph than I had anticipated. 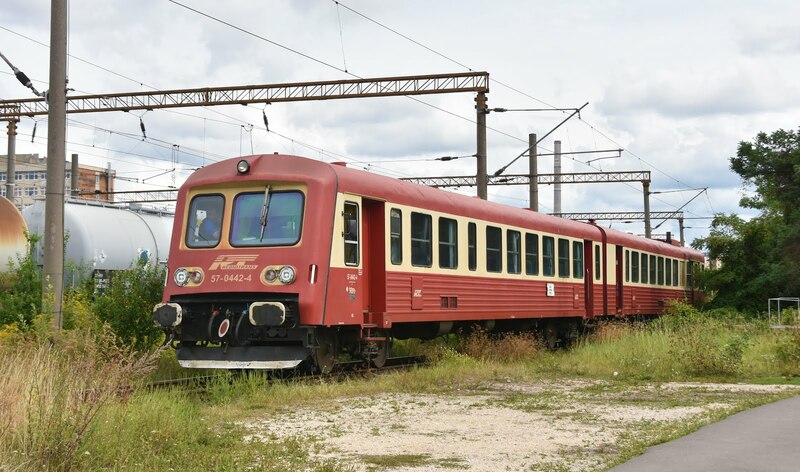 It seems that the GFR BB25200's may even be being painted into 'Fret' colours as almost all the examples we saw wore this livery and generally looked quite smart. Several of the push-pull RIO sets used by RegioTrans have also been refurbished to a high standard and all of the BB25500's we saw were now devoid of the French liveries (though it is believed that a solitary Fret example is still running around). As with anywhere it is great to see proper diesel loco and stock workings and there are certainly plenty to chase around Romainia even if a lot of them are quite few and far between. The Sulzers are lovely locos but one shouldn't expect much thrash out of them on trains which are often very lightly loaded and certainly don't go all that fast. It was nice also to bump into so many other British enthusiasts- five in total across our time in Bucharest. David (at Bucharest on the first day) Chris and Mike (in the IBIS) and Gruntle and Mike (at Bucharest on the last day)- I hope you all had successful trips. Unfortunately a good week ended rather disastrously with a the flight home being a complete farce- but that, as they say, is another story! Yet another very enjoyable read there James. I'm not long back from a short transit trip through Romania myself on the way back to the PMR (eastern Moldavia). 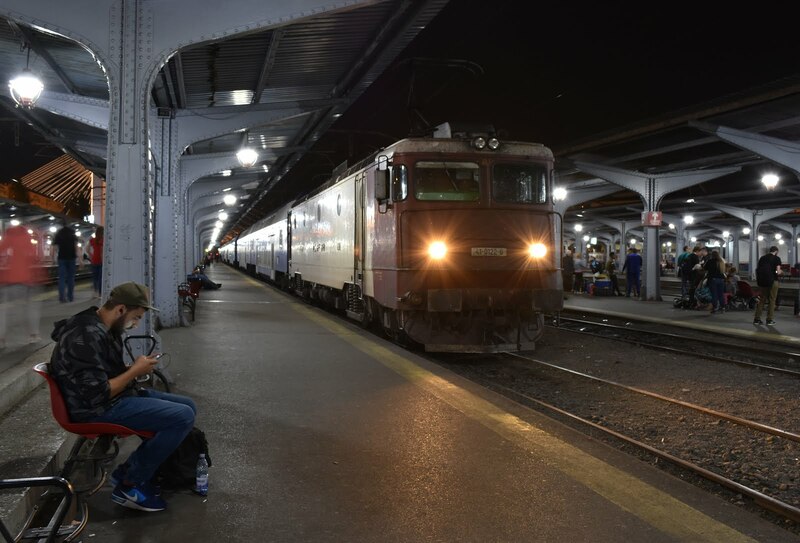 I took the IC 75 "Transylvania" from Budapest to Arad for a long overnight IR to Iași and Ungeny on the border, another crazy experience I really do need to find the time to write about! I love you trip reports, keep them coming! !